(London Post) British Prime Minister Cameron urged the UK and India to forge a stronger partnership after talks with his Indian counterpart, Narendra Modi. Protestors in London warned of a growing climate of fear in India. Cameron said the two countries were expected to sign 9 billion pounds ($14 billion, 12.7 billion euros) worth of deals during the visit, including a plan for London’s financial district to become a center of offshore rupee bonds. Other agreements expected to be signed during the visit covered financing for Indian infrastructure, cooperation in nuclear energy, and joint research in new technology. Modi’s three-day trip is not an official state visit since Modi is not a head of state, but he was nevertheless welcomed with great honors, including a fly-past by the Royal Air Force Red Arrows and a lunch with Queen Elizabeth II at Buckingham Palace scheduled for Friday. Modi was also the latest global leader to stress the merits of Britain’s membership of the European Union before an upcoming referendum in 2017. He said he would not tell Britons how to vote while explaining the benefits to India of Britain’s presence within the 28-member bloc. 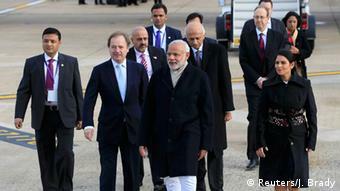 “As far as India is concerned, if there is an entry point for us to the European Union that is the UK,” Modi said. On a state visit last month Chinese President Xi Jinping told Britain he wanted to see a united European Union in his most direct comments on the issue. US President Barack Obama has also called on Britain to vote to stay in. Meanwhile, several hundred people, including Muslims, Sikhs, Nepalese and members of women’s groups, protested outside the British prime minister’s residence at 10 Downing Street. 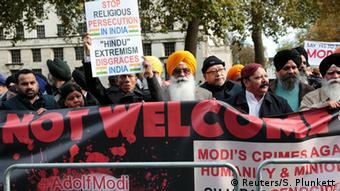 Protesters accused Modi of overseeing the persecution of India’s minorities. Modi had to be taken into Downing Street through a back route to avoid the protesters. Some protestors accused Modi of an “illegal blockade in Nepal,” where India has been blocking the border, citing security concerns, after violent protests broke out in Nepal’s southern plains three months ago. More than 200 writers, including novelists Salman Rushdie, Ian McEwan and Val McDermid, had previously signed a letter expressing concern about what they called “a rising climate of fear, growing intolerance and violence towards critical voices” in India. Modi’s relationship with the West has not always been easy. Britain and the United States both shunned the Indian politician after anti-Muslim riots in 2002 saw at least 1,000 people killed in India’s western state of Gujarat, where Modi was then the top official. The controversial politician later swept to power in 2014 on promises to develop India’s economy and root out the corruption. His Bharatiya Janata Party (BJP) suffered a recentdefeat in an important election in Bihar state , which has widely been seen as a referendum on Modi’s waning popularity. The highlight of Modi’s visit will likely be his speech to an expected 60,000 people at London’s iconic Wembley Stadium on Friday afternoon. The speech will mostly be aimed at the 1.5 million strong Indian community in the UK. Cameron will also deliver a welcome speech at the four-hour event, which coincides with the traditional Hindu Diwali festival, or “festival of lights,” and also will feature singers, dancers and a fireworks display.